A classic dish eaten all over the world, and everyone seems to have their own recipe. 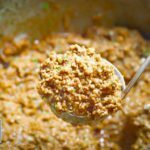 This Keto Spaghetti Sauce Recipe is rich, thick and very tasty. Place the beef stock into a small saucepan and simmer over medium-high heat until it reduces into 1 cup of liquid. In a large saucepan over high heat, place the tallow and allow to melt and heat. Add the diced onion, garlic, marjoram and salt. Saute for 5 minutes, until the onions have softened and turned translucent. Add the ground beef and saute until browned. Reduce the heat to low. Pour in the tomato puree and reduced beef stock and simmer, uncovered, and stirring occasionally for 60-80 minutes. The liquid should be mostly absorbed, leaving a thick and rich sauce. Add the remaining ingredients, check the seasoning and add more salt or pepper if desired. Remove from the heat, serve and enjoy.